An inflatable model for a space station that was designed in 1961. In this historical photo from the U.S. space agency, a model of an inflatable space station concept with a solar power system collector in 1961. 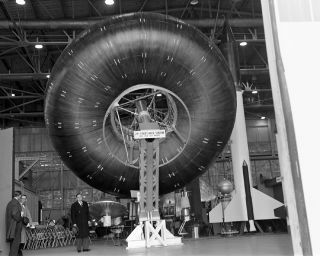 It was 24 feet in diameter with internal fabric bulkhead which could be separately pressurized in an emergency.